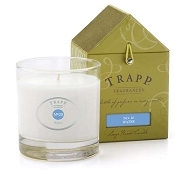 Trapp Candles No 8-Fresh Cut Tuberose, 7 Oz Poured Candle in a newly designed box with the classic Trapp house design. A tropical white flower with an intense, heady floral fragrance - suggestive of a gardenia, only more powerful and memorable. I love a powerful scent and tuberose became my favorite trapp scent after gardenia was dropped, this is close. Not sweet, not cute, it is mystical but not woody or too spicy. Trapp candles and Zanadia are the best! Trapp candles have been the only candles I've purchased for over a decade. I know my favorites, so Zanadia is perfect. I placed my order on Friday, and they arrived on Monday. I bought two of each: Fresh Cut Tuberose, Jasmine-Gardenia, and Bob's Flower Shop. The blend of these three fragrances is beautiful. I'm so glad to have found Zanadia - I don't have to go through all the shopping baloney, I log in and place my order, and I get them straight away. I ordered Tuberose and have always loved it, they sent a small candle of White Lotus & Lychee OMG it was wonderful. Even though they said my order was on back order I received it in a very timely manner. I will be ordering for Zanadia again. 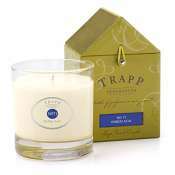 If you have never tried Trapp Candles you are missing one of the best we have every used. I cannot even describe how much I love this product! I purchased it for my husband because he spent years living in Hawaii when he was younger. He was absolutely delighted with the candle and the scent. It looks so elegant and the fragrance took him back to his days in Hawaii. Additionally, the candle came with a little hand written message - which is unheard of in today's world and made all the difference! My only wish is that there were more offerings in this scent (i.e. shampoo, bubble bath, lotion, etc. ).